Incarnate has all of the makings of a great book - gorgeous cover, fresh and intriguing idea, and a good blend of fantasy and romance. From the very beginning I found myself lost in Ana's world and wanted to linger there even after I had finished the book. In the land of Heart, there are a million souls, and each of them have been reincarnated for thousands of years. And then Ana was born...and her soul didn't match any previous soul. Because of this, Ana has been taught all her life that she is a nosoul, a mistake, and someone who quite possibly only has one life to live. Ana is desperate to leave her mother's tyrannical house and find out more about why she was born, but she never imagined the dangers or the resistance she would face. Fortunately she meets Sam, who believes that Ana is not a nosoul but a new soul. With Sam's help, Ana is able to reach Heart and begin her quest for knowledge. Yet not all the souls in Heart are happy about this turn of events...and there may be some who would stop at nothing to take Ana's one life. First things first. Incarnate may be about reincarnated souls, but it is not your typical reincarnation story. For instance, all of the reincarnated souls retained their memories of their past lives. In addition, Meadows' take on soulmates is slightly different from what I've seen before, though it does have validity. Finally, because Ana was a new soul, her journey was very different from what it would have been had she been reincarnated from a previous life. As we learn through Ana, the world of Range is a most interesting one, combining ancient fantastical creatures such as dragons with modern technology with a dash of a new deity. I enjoyed many of the characters in this book and their easy relationships with one another; I truly did feel like I was amongst an old group of friends. And then there was Sam. For those of you who know me, if you read this book, you will know exactly why I love Sam. There's just something about him...and there are definitely some swoon-worthy scenes between him and Ana. Although there were many things I liked about this book, there were also a few things that bothered me. It seemed like the writing took a while to even out; in the beginning, there were moments of beautiful prose, but they were often juxtaposed with fragments that seemed jarring (and often ones that presented Ana as more surly than I think she was). At times it was hard for me to connect with Ana. Both her self-pity and the comparison between her and a butterfly were mentioned frequently throughout the book, almost to the point of detracting from their intended purpose. That being said, the world and the other characters were more than enough to keep me reading. 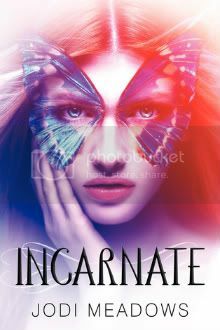 If you like reincarnation stories, fantasy settings, and a sweet, believable romance, you will want to read Incarnate. I will look forward to seeing what else is in store for Ana and Sam! Excellent review. I have this book, but haven't had the chance to read it. I was on the fence about this book, but your review has convinced me to read it.